Do you believe in miracles? Yes we do. I depart from my usual Seattle Mariners blather to express my amazement the Seattle Seahawks won the NFC Conference championship and are heading to Phoenix for the Super Duper Bowl. I catch almost all Seahawks games on the tube, and I have to admit I don’t remember seeing such a dreadful Seahawks performance for 57 minutes on the field- maybe ever. Down 19-7, with the only points coming on a marvelous touchdown throw off a fake field goal, the Seahawks looked like they were dead and buried. The Packers struck early and often. Though able to manage some strong, desultory running by Marshawn Lynch, the Russell Wilson passing game was all but invisible. The Seahawks were dead with 3:02 left in the game. But they managed to summon up a series of miracles to win this game and make it the most memorable game in all of Seattle sports history. Miracle Two: Wilson runs 1 yard for a touchdown off the option. The entire Packers team runs in from the sideline to tackle Lynch, who unfortunately doesn’t have the ball, but carries everyone into the end zone anyway. 2:13 left to play. Miracle Three. Marshawn Lynch runs for 24 yards, making doubly sure his junk is intact as he crosses the goal line. Seahawks lead by a point. Miracle Four: Seahawks elect to go for two. Wilson rolls to his right, can’t find his man, and tosses a mortar shot back across the field, over all the defenders, and to the waiting arms of tight end Luke Willson who ambles across the goal line for a three point lead. No catch, the Packers kick their field goal to win the game. Miracle Six: The final miracle is when Packers coach Mike McCarthy called a cover zero on consecutive plays and Wilson made two beautiful throws to win the game. Cover zero means no safety in the center of the field. However the miracles weren’t quite over as Wilson chucked the touchdown pass to Jermaine Cursed, he of two clanks turned into interceptions, and two misses. How can this kind of redemption not be some kind of miracle? So the Seahawks are in Super Bowl XLIX to face the New England Patriots. If I was a Patriots fan, I’d be concerned. It’s clear some omniscient being is rooting for the Seahawks. Beware of a tunnel collapse at University of Phoenix Stadium. Beware freak sandstorms along the New England bench. Coach Belichick should beware of a short in the compressors used to inflate, or deflate footballs. Darrelle Revis, beware of designed plays of Wilson clanking off the hands of Kearse, clonking you in the noggin and knocking you cold. I’m telling you, the Seahawks are anointed by fate and I wouldn’t like the finger of the almighty pointed at me. Today the Baseball Writers Association of America (BBWAA) and the Internet Baseball Writers Association of America (IBWAA) revealed the results of their Hall of Fame voting.The differences between the two outcomes are remarkable. The internet writers voted somewhat differently. They also voted in first-timers Johnson, Martinez, and Smoltz, but they also voted in Astros first baseman Jeff Bagwell and Expos/White Sox outfielder Tim Raines. The IBWAA already included Biggio and catcher Mike Piazza in its Hall. Voting members are allowed to vote for up to 15 members for the IBWAA Hall of Fame. A player remains on the ballot for up to 15 years, unless he is elected by the 75% threshold, or if his votes fall below 5%. Then he is no longer eligible to be elected unless he is reconsidered by Veteran’s Committee. There are significant differences between the two voting bodies. The larger number of votes allowed for the internet writers created much higher voting percentages on the IBWAA ballot, and also allowed for election of one more player. According to the IBWAA website, ballots cast contained an average 11.084 votes per member. Jay Jaffe’s analysis at SI.com showed the print writers included 8.42 names per ballot. Another difference is in the votes for Barry Bonds and Roger Clemens. The internet writers gave far greater support to both players strongly suspected of steroid use during their playing days. While both players received slight upticks on the BBWAA ballots, Clemens and Bonds are only 10% short of election to the internet hall. It would be interesting to hear an explanation of the difference. However, I suspect IBWAA members are younger and willing to move on from baseball’s sordid steroid past. The difference also demonstrates how broken the BBWAA voting has become. This ballot was packed with Hall-worthy candidates. But letting Hall-worthy candidates back up against a newly imposed limit 10 year limit, while limiting voters to only 10 selections seems truly unfair. Deserving candidates such as Tim Raines, Edgar Martinez, and Fred McGriff run a likely risk of falling off the ballot without the opportunity to build a developing consensus in support of their election as happened for players like Burt Blyleven. It is also interesting to note that the IBWAA Hall and Cooperstown began the day with a difference of three members. Today that difference is five. Next year, as the internet writers continue with their larger ballots, how much divergence will there be between the two Halls. While it certainly is empowering for bloggers to have their say, is IBWAA simply creating an interesting anomaly that will become increasing irrelevant as the differences become greater? It will be interesting to see how future votes play out. What’s the matter with the NFL? 20. Eighty degrees, a cold beer and a short-sleeve shirt is better than 30 degrees, a hip flask and six layers of clothes under a lap blanket. Take your pick: suntan or frostbite. 25. More good baseball books appear in a single year than have been written about football in the past 50 years. The best football writers, like Dan Jenkins, have the good sense to write about something else most of the time. 46. Parity scheduling. How can the NFL defend the fairness of deliberately giving easier schedules to weaker teams and harder schedules to better teams? Just to generate artificially improved competition? When a weak team with a patsy schedule goes 10-6, while a strong defending division champ misses the playoffs at 9-7, nobody says boo. Baseball would have open revolt at such a nauseatingly cynical system. 53. Football fans tailgate before the big game. No baseball fan would have a picnic in a parking lot. The entire list can be found at BaseballAlmanac.com I share this not just to showcase Boswell’s considerable talent and insight. Rather to share my view that the NFL is run by a collection of malefactors of great wealth in their own self-interest. This has been a horrible moral and ethical year for the National Football League, mostly because Roger Goodell and the other stooges who run the league can’t see fit to be forthcoming about problems facing the league. Before I leap into beating up football, let me just be clear. I am a fan blogger and I write mostly because I have a passion for baseball, especially my hometown team the Mariners. But I also realize I am a hopeless homer, and it’s hard not to be utterly infatuated with the World Champion Seahawks, a Husky football team that seems to be on the rise, as well as the Tacoma Rainiers. My beef with football has nothing to do with the Seahawks, but just the general decision making around ethical issues that seem to be routine around the NFL, and they just as routinely seem to transform into the huge icebergs they can ram their Titanic-sized business into. 1. 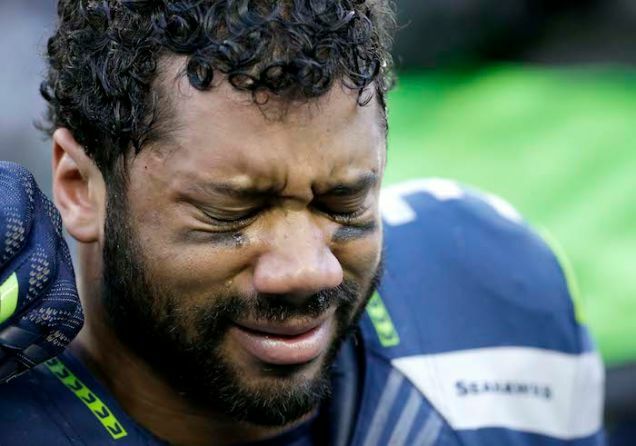 I almost gave up watching Seahawks games this year. Heck, when they were 3-3 lots of other people probably felt the same. But that’s not why. I have an excruciatingly difficult time financially supporting a game that is essentially killing its players. The NFL has done all it can to cover up the effects of repeated brain trauma (CTE) on its players, despite clear and increasing evidence this is a routine byproduct of the sport. One need only examine the cases of deceased players Mike Webster, Junior Seau, and Dave Duerson to know that something is desperately wrong here. I understand that to address this issue may require major changes to the sport, but these same injuries are also appearing in college, high school and younger players. Don’t get me wrong, these problems didn’t start on Roger Goodell’s watch, but it’s the way he’s handling it today that is the problem. It can’t continue the way it is, and the NFL can’t continue to hide behind a screen of lawyers and quackery. 2. The NFL also chose to muff the handling of this year’s problem du jour, domestic violence. The public disclosure of the Ray Rice video gave the NFL an opportunity to take a decisive stand against domestic violence by levying an appropriate and complex penalty on the offending player. Instead it offered a two week wrist slap. When additional details and footage became available it overreached by suspending Rice indefinitely without even considering Rice’s due process rights, and suffered a subsequent overturning of the penalty in court. In addition to looking like the gang that couldn’t shoot straight, it became clear the NFL had access to the complete Rice video before the press did and acted as the NFL always seems to do–it suppressed the evidence. Who are these people? 3. Another gigantic complaint is the NFL wants to be in players’ off-field business in all kinds of trivial and unimportant ways and remain completely lost in the important ones. Example number one, is your favorite Seahawk and mine, Marshawn Lynch. By all accounts Lynch is a great teammate, his performance on the field speaks for itself, his value to his team is incalculable (er, at least seven million dollars as his contract currently stands.) Yet the NFL hectors and harasses Lynch mercilessly about his relations with the press and their access to them. They threatened him with fines during last year’s Super Bowl Week. They fined him $100,000 for his lack of answers to the press after Week 15. This, of course, prompted Lynch during the following week to give two simple sentences to reporters questions beginning with “Thanks for asking. . “. and ending with something meaningless. A hundred grand followed by what everybody knows to be a game to avoid future fines. Who gives a hoot in hell about what Marshawn Lynch says to the press? But when Detroit Lions defensive star Ndamukong Suh stomps on the leg of a prone Aaron Rodgers, he was first suspended. On appeal, Suh’s suspension was lifted and replaced with a $70,000 fine. Really. So which is more worthy of NFL intervention-that Lynch won’t talk to the press or that Suh stomps one of the best quarterbacks in the game when he is defenseless? $100,000 for silence vs. $70,000 for malicious intent . . . I know how my scale of justice tilts. 4. Where the hell did Dan Snyder come from? What planet? What parallel universe? Maybe the Bizarro planet? First, Snyder’s a terrible owner and the Redskins have become a football stinkhole. Coaches have come and mostly gone. The RGIII draft pick is the recurring nightmare week in and week out. But Snyder’s tin ear regarding the team nickname is simply inexcusable. It’s clear most District inhabitants, and the rest of the country believes it is time to change its name, If Native Americans find the name insulting–take them at their word, it’s insulting. There must be a respect-inducing name the Washington football team could boast. It might help their steadily shrinking legion of fans forget it’s the same godawful team. And why hasn’t the NFL, the same body fining Marshawn Lynch for refusing to entertain the press corps, inflicted its will on Mr. Snyder? Follow the money. There’s just something wrong with the NFL. Yes, I know MLB isn’t perfect, but the NFL seems to have become a money machine, sucking in giant gobs of cash for its owners while Goodell and his buffonish minions do a terrible job of trying to protect the image of what increasingly is becoming a gladiatorial sport. They don’t seem to have the best interests of their players or fans at fault, only the interest of protecting their billions of dollars in assets and cash flow. I know the fans love it, but if they only thought about it. . . another thing better about baseball than football. I’ve gone on ad infinitum about joining the Internet Baseball Writers Association of America, and I’m proud to be a member of such an august body. Each year the IBWAA asks its members to vote for inductees to the Baseball Hall of Fame. More than anything, I think it’s an opportunity to share thinking on the class eligible for inclusion in Cooperstown. IBWAA allows its members 15 votes instead of the ten allowed by the BBWAA. The internet writers have acted differently than the print guys, and as a result they’ve created a sort of parallel Hall. In the IBWAA, Barry Larkin is not in the HOF, but Mike Piazza and Craig Biggio are. Tim Raines was a great combination of a high on-base percentage and speed that helped the Expos, White Sox and Yankees score runs and win. Raines finished with a career .385 OBP, stole 808 bases, and six time scored more than 100 runs in a season. He was a six time all star. He has 66.4 WAR, slightly a (Fangraphs) and Jay Jaffe rates him above the average Hall of Famer in both career and peak values. He should be in the Hall. Alan Trammell is one of my favorite players not in the Hall of Fame. He had the bad fortune to begin playing after Robin Yount, and before Cal Ripken, Jr. and Alex Rodriguez. He was an anchor on the really good Tigers teams of the 1980’s, and he went on to have a 20 year career with Detroit. After his playing days were over he was the unfortunate manager who was sacrificed as the Tigers were stripped to historically bad loss levels before being rebuilt to their current prominence in the American League Central. Trammell was a very good player–not as good as Yount, Ripken or A-Rod, but better than Hall of Famers Ozzie Smith and 2012 inductee Barry Larkin. Jaffe rates him above the average Hall of Fame shortstop, and he gets my vote. Edgar Martinez was the best DH ever, arguably the greatest Mariner ever. He came to the league late, foolishly kept in the minors by the M’s until his age 27 season. He was an average third baseman until he tore his hamstrings at an exhibition game in Vancouver’s BC Place, and became a full time designated hitter. He won two batting titles and five silver sluggers. Edgar was a seven time All Star. He finished with a .312/.418/.515 slash line and a career OPS+ of 147. But he’s a DH, an argument that many have used against him in their voting. Jaffe rates him above HOF 3rd basemen, all corner infielders and just plain hitters for career and peak WAR numbers. Though he lacks the counting stats many voters look for in their voting, he should be in the Hall of Fame. Pedro Martinez was one of the most electrifying pitchers I ever saw. He owned the Seattle Mariners. They’d see him maybe twice a year. He might give up a run on four hits, while the Red Sox pounded whichever luckless Mariner was on the mound. It was sad. Pedro was a great pitcher, that threw in an age when scoring was way up. Though he had only 217 wins, he won three Cy Young Awards, led the league in ERA five times, in strikeouts three times, in WHIP six times (in 2000 with a .737!! ), in ERA+ five times (each over 200,) and FIP five times. Old stats or new stats, Pedro ruled. With 87.1 WAR, Martinez easily surpasses average HOF pitchers. He was a great one and it is an honor to vote for him. Randy Johnson was an amazing pitcher. He was always fun to watch in the Kingdome. I remember seeing him as a younger pitcher struggling with his control and he could really turn a game into a major walkfest. But in 1993 he really turned it on and simply became one of the best pitchers in baseball. Tough to see him walk in 1998 and I don’t think I forgave him for seemingly tanking his season until his trade to the Astros until a couple years ago. 303 wins, five Cy Youngs, the highest K/9 ration in history (10.6.) No hitters, a perfect game, 2nd all time in strikeouts; please. There can be no doubt. I don’t suppose he’ll enter Cooperstown as a Mariner. John Smoltz was one of the Atlanta Big Three pitchers with Tom Glavine and Greg Maddox that dominated the National League East from 1995-2007. Smoltz has 217 career wins, shy of the 300 mark voters like to see, but he also earned 154 career saves when he surrendered his starting role to become the Braves closer for three years 2002-4. Smoltz won the Cy Young in 1996, pitched in eight All-Star games and his 3,084 strikeouts ranks 16th on the all time list. He was a great post-season pitcher with 15-4 record. Advanced stats don’t love Smoltz. He ranks below average starting HOF pitchers in WAR, partly because of his years moonlighting as a reliever. Jaffe believes Smoltz to be Hall-worthy but a consensus will have to be created for his election. I don’t need any extra convincing, and have a hard time believing Atlanta would have been so successful without his contribution. Mike Mussina pitched for 10 years with the Baltimore Orioles and eight years with the Yankees and became one of the more consistently nasty pitchers in the American League. He won 270 games. Though he was not a flame-thrower a la Johnson, Smoltz, and Martinez he threw hard enough to be effective and had great control. He didn’t win a Cy Young Award, but was in the top 6 for votes nine times and he appeared in five All-Star games. Fangraphs shows Mussina with 82.5 WAR, higher than the career WAR for a Hall of Famer, but his peak WAR is somewhat less. A number of writers have held his lack of 20 win seasons against him. I believe he was a remarkably consistent, hard nosed competitor for the Orioles and Yankees. I had to hold my nose to vote for Curt Schilling due to his recent outbursts of stupid Christian, conservative blather on social media. He’s an example of one of those not particularly nice people who belong in the Hall of Fame. Though Schilling only has 216 wins, he also pitched for some fairly wretched Phillies teams early in his career, and had some serious injury problems. Schilling really blossomed after his trade to the Diamondbacks, and then on to Boston where his “bloody sock” is forever enshrined in Red Sox Nation memory. Schilling pitched in six All Star games, struck out 3,116 (15th best all-time) and had a formidable 11-3 record in post-season games. He earned 83.2 career WAR, well above the average for HOF starting pitchers. Come in Curt, but be sure to be on your best behavior. Barry Larkin elected to the Major League Hall of Fame in 2012, not quite sure why his face is pressed up against the glass for the IBWAA, but I’m doing my part to shoo him in through the door. Jeff Bagwell was a wonderful first baseman for the Astros who has been wrongfully tainted with steroid rumors without any kind of evidence convict him. That’s terrible. I am quite steroid averse, but refuse to accuse an entire generation of players just for the time they played in. Bagwell had a slash of .297/.408/.540. He was Rookie of the Year in 1991 and won an MVP in 1994. Bagwell appeared in four All-Star Games and won three Silver Sluggers. An oddity for a first baseman, Bagwell was a combination of speed and power, with 449 home runs and 202 stolen bases. Bagwell’ 80.2 WAR is well above average first basemen in the Hall both for career and peak values. He should definitely be joining teammate Biggio in Cooperstown, er, the parallel Cooperstown. A quick word about Barry Bonds and Roger Clemens. It is clear to me there is a current among many voters to argue in favor of their inclusion because their career statistics were sufficient to gain them Hall entry before their steroid use. At least at the present time, I am immune to this argument. They could be right, it simply doesn’t matter to me. To vote for them knowing this simply legitimizes a behavior that changed the sport for a decade or more. Bonds and Clemens have their money, they have their records intact, I will not condone their behavior by suggesting their behavior was moral and ethical. What signal does that send to the next crop of ballplayer tempted by some new way around the rules? No.